Motor racing and mayhem, the non-stop pursuit of outrageous dreams, high-speed thrills and a really good time, these are the raw materials of Full Throttle. 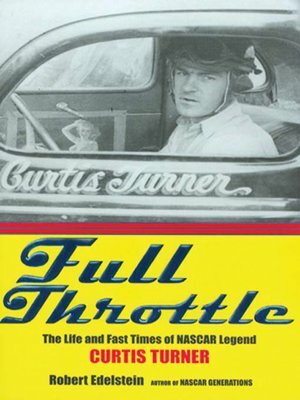 Curtis Turner was the most dynamic stock-car racer of all time; he wrote the book on living fast and dying young. The first NASCAR celebrity, his life embodied all that made NASCAR a hit spectator sport: the adrenaline rush of the races, the potential for danger at every turn, and the charismatic, outrageous personality of a winner. He created drama at the racetrack and in his personal life, living the American Dream several times over before he died a violent and mysterious death at the young age of forty-six. Edelstein's gripping biography thrillingly recreates the life of this American legend, from his days as a teenage moonshine runner in Virginia, through millions earned (and just as quickly spent) in fearless finance deals, to his incredible comeback after four years of being banned from the NASCAR circuit.